My best pattern to catch pike. 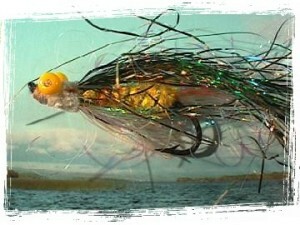 First tied in 1987, with colours changing from a rather dark overall look to a more light one to accommodate different situations or tastes; of pike and angler. You want a hefty rod to cast these things. I use a class 9, ten foot long salmon rod. Instead of a wire trace a short length of 0.70 mm mono-filament is added. The overall cast should not be longer than 1 meter or so. Otherwise the casting becomes a dodgy affair. The streamer works best when fished slow, a good method is to let it sink and then bring it up to the surface by lifting the rod. Two well known anglers of the region, Ruediger, Dietrich and a visiting German angler, named Guenter, decided to go for pike: fish a certain lake in the South-West of Donegal, known for its good stock of that big fish. One of the well known anglers of the region had actually a small red boat lying there, a fact which had made the choice of water even easier. All the important ingredients for a good day's pike fishing, like cool-box with beer and sausages, flask with coffee, a barbecue and charcoal, rods and reels etc. were loaded into the van. The German visitor, whose figure allowed the conclusion that he loved his food and a good dose of that famous German beverage called Pils, announced :I think I try the Belly Boat. The tackle dealer back home gave me a Belly Boat, to put it to the test in Ireland. The thing, looking like an olive green tractor-tyre-tube with pieces of net and a few straps attached to it, was pumped up in no time by means of mighty bellows. Other essentials for conquering the waters with a belly boat, like flippers and a pair of chest waders, filled up the little van completely. It was decided to go with two cars. The weather was great; thick cloud cover, a good breeze and not to warm. Expectations high the two well known anglers of the region and their German visiting angler arrived at the lake, parked the cars up by the farmhouse opposite the gate, from where a path lead down to the lake. Belly boat and accessories had to be unloaded first to get to the fly rods, which were already armed with huge streamers. A little white car, driven by a middle aged woman, drove past as the German visiting angler was in the middle of that awkward process to get into the chest waders. She slowed down a bit to wave friendly and the anglers waved back. One of the well known anglers of the region wanted to fish from the banks, the other walked down to where his boat lay. The German visiting angler put on his flippers and climbed into the belly boat. The piece of net between his thighs held him firmly in the middle of the inflated rubber ring, which reached almost up to arm-pit level; one of the straps was used to attach a big landing net. As he walked through the gate, the little white car drove past again, this time brought almost to a still stand by the woman. It took the German visiting angler a good while to get down to the lake, flippers and the wind, catching his bulky figure, slowed him down considerably; the fly-rod in his right hand looked like a balancing device. The two well known anglers of the region fished a very promising spot, near a little inlet. One from the bank, the other from his little red boat outside a patch of water-lilies. Guenter forced himself through the thick ring of reeds surrounding the water. When his feet lost contact to the ground he began to propel himself forward with help of the flippers. He is very fast with that thing, commented one well known angler of the region as they watched their German visiting angler breaking through the waves, approaching the middle of the lake. But he should know that the pike are only close to the reeds, replied the other well known angler of the region. In the background up on the road the little white car drove past and it looked like it stopped actually for a little moment. At that time the well known angler of the region fishing from his boat, hooked a pike. The visiting German angler turned his belly boat around and headed for the bank where he came from. Why is he in such a hurry to get back? remarked Ruediger, playing the fish. They watched their visitor arriving at the reeds, pushing himself through, and as he walked up to the gate he seemed to have acquired more gravity, the wind didn't affect his balance at all any more. The well known angler of the region decided the pike was too small and put it back, organised his landing net for another possible fish, when the German visiting angler appeared in the distance at the gate, wearing nothing but a pink shirt, which fluttered vigorously in the wind. There must be something wrong with our visitor, detected the two well known anglers of the region, the one in the boat picked up the one on the bank and rowed across the lake, to find out what might bother the man. The Belly Boat is not to recommend for Ireland, spoke the German visiting angler, as the two well known anglers of the region arrived at the cars and gaped at the display of belly boat and wet clothes, draped over fence and bushes. It was okay at first, continued Guenter, but when I came towards the middle of the lake, the waves splashed against the front of the belly boat and into my chest waders, then I turned around and that was even worse, because there is more of a gap between chest waders and body at the back; they were filled up to the brim in no time. The little white car passed again, the woman, astonished, had a good look. Must tell this tackle dealer at home that Belly Boats are not to recommend for Ireland, repeated the German visiting angler, whereupon Ruediger, the well known angler of the region said, let's start with the barbecue then.